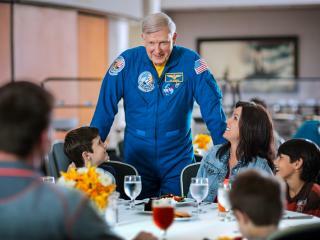 Lunch with an Astronaut Program - once-in-a-lifetime chance to have lunch with a real-life astronaut. Hear about space adventures first-hand from someone Who has experienced a launch and the wild ride into orbit. Kennedy Space Center Explore Tour - a 2-hour tour offering access to areas Otherwise open only to NASA personnel: such as the Space Shuttle launch pads. Drive by NASA’s KSC Headquarters, operations buildings and Launch Pad 39B. Disembark for photos at the NASA Causeway, Vehicle Assembly Building, and camera bunker with views of launch pads and the Atlantic Ocean*. The Kennedy Space Center Space Pass with Transportation excursion operates daily, year round. The tour picks up from various central locations in Orlando between 7.30am and 8.30am and departs for Kennedy Space Center Visitor Complex at around 8.45am. The return departure time to Orlando is around 5.30pm. Transfer time to Kennedy Space Center Visitors Complex is around 1.5 hours. *NASA reserves the right to cancel or alter locations and/or security requirements for the Kennedy Space Center Explore Tour without notice.